First of all, Intel's benchmarks lend further support to what we already suspected: Intel's Scalable Xeon is better at serving databases for a number of reasons: better data locality (fewer NUMA nodes), better single-threaded performance, and a more "useable" cache. The claim that Intel offers much more predictable database performance seems very reasonable to us: the EPYC platform is much younger and much more complex to tune as it is a "virtual 8 socket" system. Secondly it is true that the Intel Scalable Xeon is more versatile: the past 5 years AMD's presence in the server market was neglible, while Intel has been steadily adding virtualization features (posted interrupts), I/O features and more (TSX for example). Many of these features are now supported by the hypervisor and OSes out there. The EPYC platform has some catching up to do. 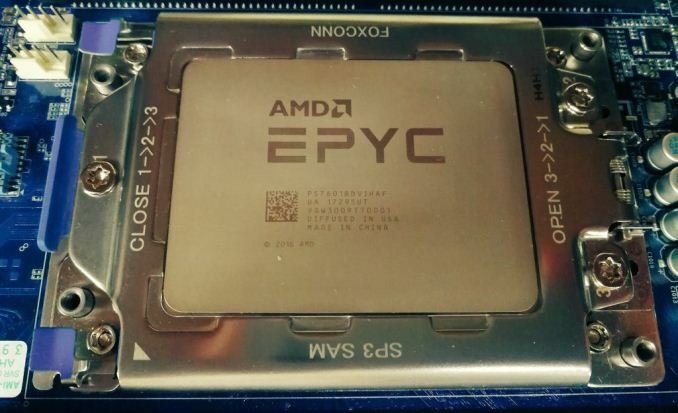 Firmware updates and other software updates were necessary to run a hypervisor, and only relatively recent versions of the Linux kernel (February 2017 w/4.10+) have support for the EPYC processor. So even if we doubt that the 8160 can really deliver 37% better performance than the AMD EPYC in the real world, there is no denying that the Intel Xeon is a "safer bet" for VMware virtualization. Nevertheless, it is interesting to see that Intel admits that there are quite a few use cases out there where AMD has an advantage. The AMD EPYC has a performance per dollar advantage in webserving and Java servers, for example. Otherwise, there is some merit to the claim that AVX-512 allows Intel to offer excellent HPC performance without the use of a GPU in compute intensive applications. At the same time, if you are after the best performance on these very parallel workloads, a GPU almost always offers several times higher performance. AVX-512 can also not save Intel in several bandwidth-intensive benchmarks such, as in fluid dynamics. One interesting element to the whole scenario is that at no point does Intel ever approach the performance per watt angle in these discussions. It leaves a big question unanswered from Intel - perhaps we should invoke Hanlon's Razor at this point and call it a missed opportunity, rather than suggest that Intel does not want to speak about power. 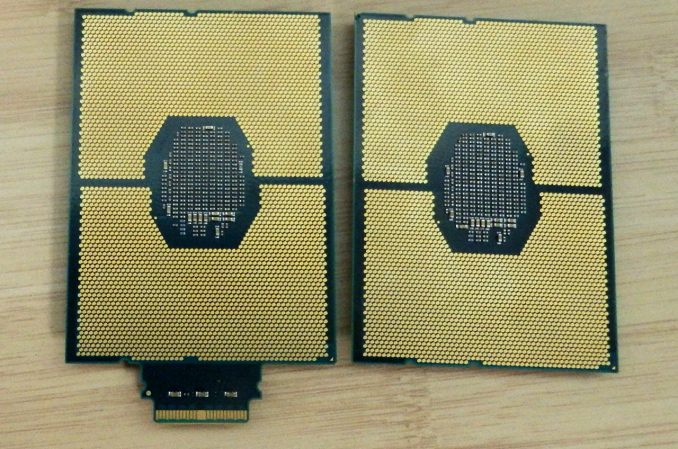 Our own results showed a win for AMD's EPYC here though, when comparing two 145W Xeon 8176 parts to two 180W EPYC 7601 parts. More testing on specific workloads is needed. In summary, Intel makes several good points, even when those points aren't always in their own favor. The company clearly has an interest in ensuring that the Xeon's performance leadership remains well-known in light of AMD's EPYC-fueled resurgence, and while there's nothing altruistic about Intel's benchmarking, they are working from a sound position. Still, in defending their position – and by extension their high margins – Intel does highlight the Xeon's biggest weakness versus the EPYC in this newly competitive market: the Skylake Xeon can offer excellent performance, but that performance comes with an equally heavy price tag. When Skylake runs AVX 512 and AVX2 instructions it causes both the clock frequency to go down *and* the voltage to go up. (https://www.intel.com/content/dam/www/public/us/en... However, it can only bring the voltage back down within 1ms. If you get a mix of AVX2 and regular instructions, like you do in the POV ray test, then it's going to be running on higher voltage the whole time. That probably explains why the Xeon 8176 drawed so much more power than the EPYC in your Energy consumption test. "A lot of time the software within a system will only vaguely know what system it is being run on, especially if that system is virtualised". Why do you say this if you publish HPC results? There the software knows exactly whay type of processor in what kind of configuration it is running. "The second is the compiler situation: in each benchmark, Intel used the Intel compiler for Intel CPUs, but compiled the AMD code on GCC, LLVM and the Intel compiler, choosing the best result" More important, what type of math library did they use? The Intel MKL has an unmatched optimization, have they used the same for the AMD system? I think this was a realistic article on analysis of the two systems. And it does point to important that Intel system is more mature system than AMD EPYC system. My personally feeling is that AMD is thrown together so that claim core count without realistically thinking about the designed. But it does give Intel a good shot in ARM with completion and I expect Intel's next revision to have significantly leap in technology. And suddenly - 8 core 6134 Skylake-SP - equals - 32 core Epyc 7601. 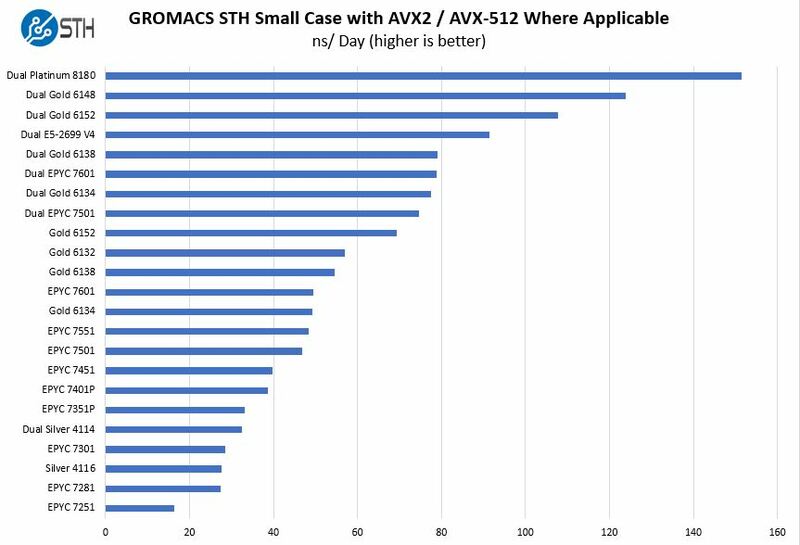 AVX512 is twice as wide as AVX2 and significant more power than the AVX2 - so yes it very possible in this this test that CPU with 1/4 the normal CPU cores can have more power because AVX512.